Your soul has a purpose to serve humanity in a bigger way. Are you ready to step up and honor your gifts? Registration closes October 12th, 2018. You are much more than your body, your emotions and your mental processing, but shhh "they" (the powers that enslave you), don't want you to know your true nature. Thousands of years ago, when our ancient and indigenous cultures were colonized, the teachings of our multidimensional nature and innate powers had to hide underground and various types of mystery schools were formed around the world to keep this powerful wisdom alive. Every ancient culture has its own version of mystery schools for young initiates to learn how to harness their innate gifts and emerge as powerful leaders. Initiates were selected by divine inheritance. It didn't matter your caste, creed, color, education, or financial status. Spirit determines who enters a mystery school by a series of awakenings, visions, and paranormal happenings. Initiates were brought to these schools to develop and master their gifts in order to live out their divine destiny as seers, healers, medicine carriers, philosophers, writers, artists, politicians, lawyers, and community leaders. Know The Self is a Mystery School for Modern Day Living. Our mission is to awaken truth seekers to their divine nature in order to make the world a more safe, just, and loving place for all sentient beings. If you feel you have been called to serve humanity, to wake up your sleeping potential, and have a deep desire to be in right relations to all that lives, you will find yourself at home here. This program is designed for Truth-Seekers. ​​​​​​Healers, Social Entrepreneurs, Modern Day Mystics, Wisdom Keepers, Shamans, Planetary Healers, New Earth Architects, Environmentalists, Change Makers, Rebels, Misfits and Responsible Anarchists; get ready to unleash your potential in a grounded, effective, and practical way. Have you ever questioned why you are here & what you are meant to do? Maybe you know what that is, but are intimidated to move forward? Enhance your intuition and gain access to multiple dimensions of your soul's knowing. Establish your own direct connection to source energy and develop a consistent spiritual practice that nourishes you. Ground your magical abilities so you can be a clear and confident vessel to deliver your gifts of service. Release manipulative programming that you may not even know has been enslaving you and holding you hostage. Receive weekly customized activations that will restore your divine template and help you fulfil your soul's mission. You will learn to take back your power and regain autonomy over your energy system, becoming a sovereign being. As a small intimate group, the council provides a safe container to develop your gifts and accelerate your mission. When we come together in this sacred way, our work creates a ripple effect out to all our relations. 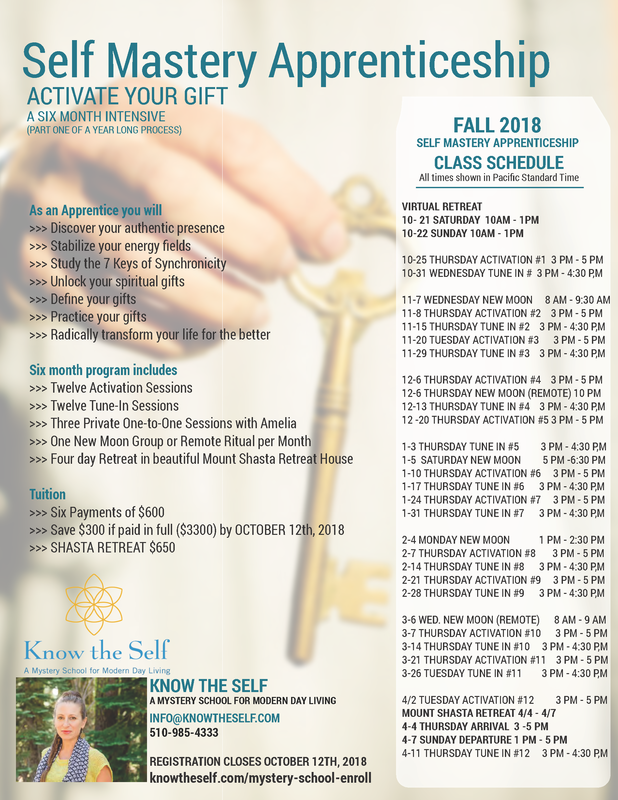 During the first six-month semester, you will establish a solid connection to your soul essence, activate your spiritual gift and establish a personal customized practice that will serve you for a lifetime. *We will study the seven keys presented in my book Synchronicity: Unlock Your Divine Destiny and work through through the exercises. *We meet weekly for 2-hour video calls alternating between Synchronicity Activations and spiritual guidance & group coaching. *Each student receives three private one-to-one sessions with Amelía during each six-month semester. *You'll be guided into meditative states of consciousness in order to awaken and unleash the power of our collective genius and activate your unique innate spiritual gifts. *You will be invited to attend an IN-PERSON Retreat in Mount Shasta, CA a powerful vortex node on the planet and meet the other students in person. The retreat is a very life enhancing experience. During the second six-months you will learn how to walk the path of spiritual leadership. * Once you have completed the apprenticeship, you will be able to ground your gift as an Adept. * We continue to meet weekly for 2 hour video calls involving Synchronicity Activations and Mastermind Calls. * Each student receives three private one-to-one sessions with Amelía throughout the second six-month semester. * You will learn about power dynamics and aligning to your moral compass in order to use your gifts properly. * You will bring your gifts out into the world in service to humanity. * You will develop your leadership abilities. * Graduation is held IN-PERSON in Mount Shasta, CA. Amelía Aeon Karris is a seer, a multi- dimensional guide, and a pioneer operating at the edge of humanity’s collective evolution. In 1994 she co-founded one of the world’s first web design companies, before the public had even heard of email. What began as introducing people to cutting-edge virtual reality and artificial intelligence has evolved into awakening people to their multi-dimensional natures. Amelía received a BA in Consciousness, Healing, and Ecology and has apprenticed in a number of mystery schools. Her powerful healing abilities and clear vision were forged during a series of spiritual initiations over a nine-year period that honed her multi sensory awareness and unique voice. Her extensive past-life recall was noted in India, first placing her on national TV and later addressing live audiences of as many as 60,000 spiritual seekers. Click the video to watch a short, entertaining video to hear directly from Arpan about his experience in being a student at Know The Self Mystery School. Who is this for & not for? Amelía only works with truth seekers and spiritual warriors who are ready to take full responsibility for their life and activate their innate abilities. If you consider yourself a rebel, a misfit, or an entrepreneur and are tired of your old stories that keep you small and you are ready to embrace a love bigger than what you thought was possible – Amelía will be happy to guide you to your Self Mastery. ​​​The Mystery School is designed for people who know the answers live within – you just need some guidance, confirmation and clear direction in your ability to listen and discover them. Amelía excel's working with people who have lost their voice, who have had a near death experience, a spontaneous kundalini awakening, or are survivors of disturbing atrocities. She only works with students who's soul's are in alignment with her own soul's mission. Being a part of the school puts you in a small team cohort of apprentices who are totally dedicated to unleashing their pure essence and bringing their gift of presence to the world. This course is NOT for anyone who feels entitled to spiritual powers or wants someone to 'fix' them. If you are looking for someone to save you, or do the hard work for you, or to take the pain away, or are just curious about magic and what Amelía can do, the Mystery School is not for you. If you feel the deep calling for your soul's mission and know you need support to step forward and be heard, you are ready! All sessions are conducted over encrypted live video conferencing, There is one virtual retreat in the beginning of each semester, and one in-person retreat offered during each semester. Students are encouraged to join Amelía in Mt. Shasta at the end of each semester for a long weekend intensive which provides an opportunity for everyone to meet in person and deepen the group connection. These retreats also provide a massive upgrade in your spiritual evolution by grounding the work in a high frequency, vortex location. The in-person retreats are charged as a separate fee based on accommodations and food. You will receive all the details of the retreats once your registration is complete. Each semester they very due to the number of people, time of year and accommodations chosen. If you would like to apply to join the Mystery School, the first step is to request a live interview with Amelía. Your request for an interview will be reviewed (and accepted or declined) based on your soul alignment with Amelía's work. Once you are accepted into the school, your financial deposit and student registration reserves your seat. After your apprenticeship course, Amelía offers a six-month Adept Course for continuing students who are ready to walk the path of Spiritual Leadership. You will always have access to the private online forum where all previous students can stay connected and receive peer-to-peer support. What we build energetically will last a lifetime. What if something changes and I need to drop out or discontinue my studies? Have you been called forth? It's time to step up and develop your gifts. "My mind was blown, there was no judgement. I have so much courage to go home and be the best example I can be. The level of integrity, the love and the goal that everyone was aspiring for was so powerful. The Shasta retreat was above and beyond any trip I have ever been on!" "I have been attending workshops guided & produced by Amelía since early 2014. I always come into each experience curious, and leave full - of life, wisdom & joy. The personal work I have done with Amelía has been transformational to say the least, and always leaves me excited for what is next." "Working with Amelía has exceeded my expectations. I was shown so many gifts I didn't know I had and ways i can use those gifts which I didn't think of before. It has totally transformed my life." Aspasia's life dramatically changed in the first 3 months! Click the video to hear Aspasia's story of how much transformed in her life just three months into the school! Classes start on October 20th. This work is very specific in who it attracts and it requires an honest commitment to your personal growth. To see if you are the right fit, set up a time to talk with Amelía directly. You will both know instantly if this is a good fit. The tuition for the school is made in monthly payments of $600 USD. You can save $700 by paying in one payment of $6500. Registration closes at Midnight on October 12th.